Human physiology is the science which treats of the life of man -- of the way in which he lives, and moves, and has his being. It teaches how man is begotten and born; how he attains maturity; and how he dies. This is a 1872 edition of the book. This treatise summarizes the current understanding of the mechanisms for blood flow control to skeletal muscle under resting conditions, how perfusion is elevated to meet the increased demand for oxygen and other substrates during exercise. This volume covers the epidemiology and physiology of pain; psychosocial contributions to pain and illness behavior; promising ways of assessing and measuring chronic pain; clinical aspects of prevention, diagnosis, treatment, and rehabilitation. Physiology is the basis of medicine. The medical student should undergo a training in practical physiology, for thereby he learns to observe, to draw conclusions from his observations, and to unravel the causes of his failures. In the present book an attempt has been made to apply physiology to medicine in the same way as anatomy has long been applied to surgery. 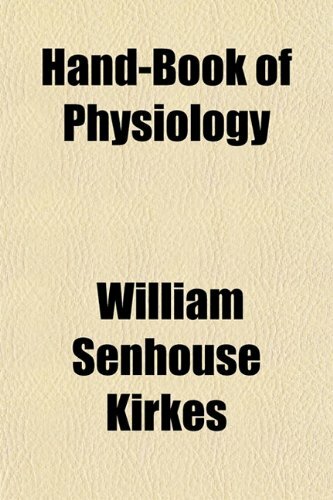 It is not intended to be a substitute for physiological textbooks, but merely a companion to them.